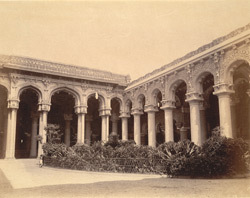 Photograph of courtyard and arcades in Trimul Naik's Palace, Madurai taken by Alexander Rea c.1890. This view shows an arcade made up of massive columns with ornate plasterwork, part of what is now known as the Tirumala Nayaka Palace. Built in 1636, as a focal point of his capital at Madurai, Tirumalai Nayak intended the palace to be one of the grandest in south India. Yet shortly after the palace's construction in 1659, Tirumalai's grandson, Chokkanatha, took the Nayaka throne. During his reign the capital was transferred to Tiruchirapalli. The move led to the dismantling of large parts of the palace and this courtyard, along with the entrance gate, main hall and dance hall, are the only parts of the palace that are left extant from the original structure. Lord Napier, in his role as governor of Madras rebuilt parts in the late 1860s, yet the palace standing today, while still impressive, is only a fraction of what was once found at the site.